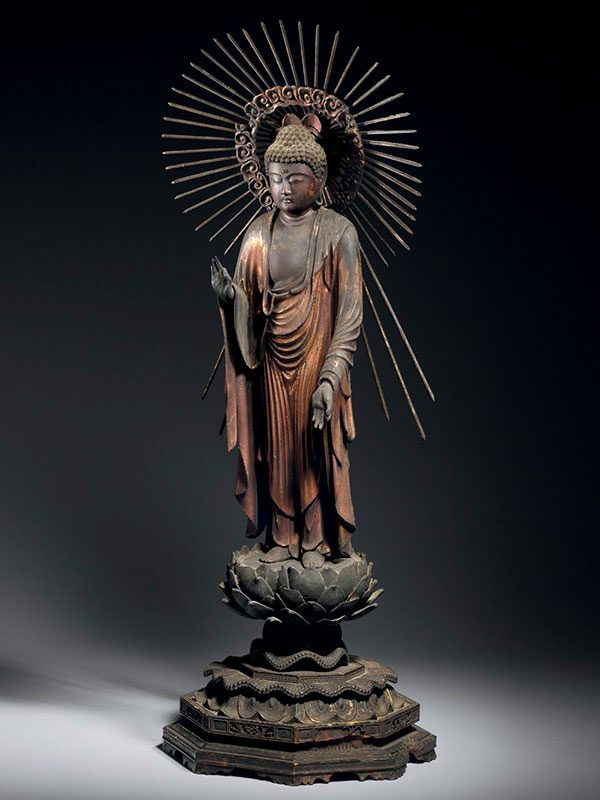 A carved wood figure of a Buddha standing on a tall, stepped lotus base, his right hand raised with the thumb and index finger clasped together. His left hand is lowered, palm upwards, also with the thumb and index finger clasped together. Both hands are held in the raigo-in (vitarka) gesture. The Buddha wears a long pleated robe revealing his bare chest and feet. A separate, ornate halo is fitted behind him. The face has a serene expression with tightly closed eyes, and the pierced ears have long earlobes that are unadorned. A translucent jewel appears in the middle of his forehead. The Buddha has an almost black patina, with some remnants of gilding visible.